Anyone with a smartphone or tablet now has access to horse-related apps for everything from choosing which blanket your horse should wear to show rules, health records and more. Will these digital equine innovations seem quaint when we’re celebrating Horse Illustrated’s 50th anniversary? Here’s a look at some of the past innovations that graced our pages and seemed groundbreaking at the time. Today, plenty of riders wear fitness trackers, like the Fitbit or Apple Watch, when they ride. These devices tell us how far we’ve ridden, for how long, and maybe even what our heart rate was during our ride. But they don’t give us much information about our horses. 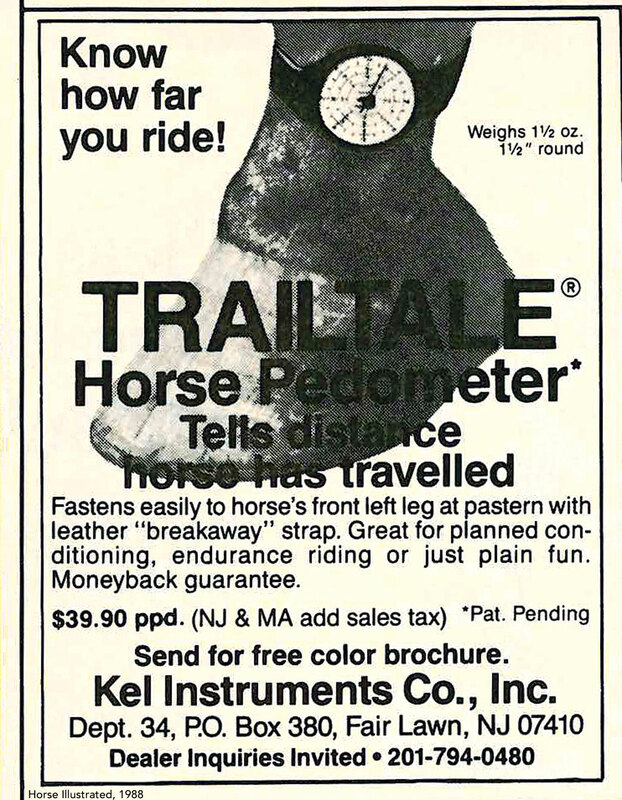 Back in 1988, the innovators at a company called Kel Instruments marketed a gizmo called the Trailtale Horse Pedometer. You’d put this device around your horse’s pastern with the breakaway strap, and then you’d hit the trail. 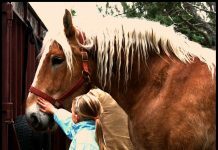 When you got back to the barn, the Trailtale would tell you how far your horse had gone. (Hopefully you were with him the whole time.) In the days before GPS or Google Maps, how else would you measure the distance of your trail ride? 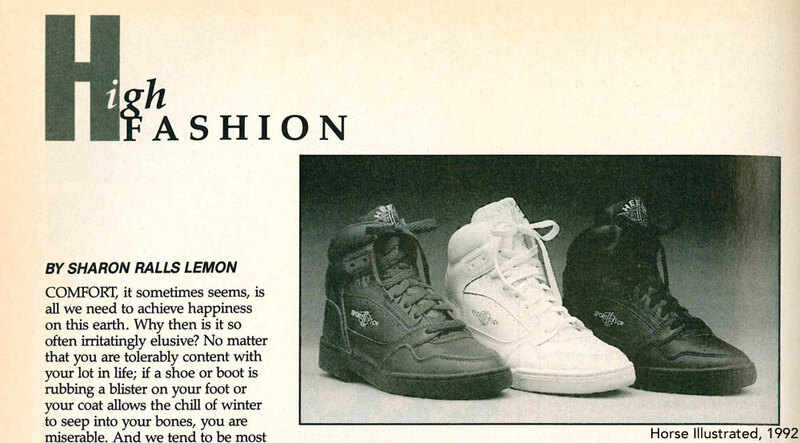 In 1992, we featured a new innovation in equestrian footwear. The Heels Down Riding Sneaker from Millers promised to give equestrians a shoe that they could wear in the saddle and while sightseeing, hiking, or running errands around town. The shoe looks like your average 1980s high top with the added benefit of a ½-inch heel as recommended for riding. Fortunately, boot makers eventually realized that they could use athletic shoe technology to make riding boots more comfortable instead of trying to make sneakers for the saddle. Today’s riding boots are perfectly comfortable and generally more fashionable. On the other hand, the Heels Down shoes do look a lot like the L.A. Gear sneakers people were sporting back in 1992, so maybe these weren’t such a bad idea. Fashion is subjective. When I was a kid, I used to spend quality time with the H volume of the World Book Encyclopedia that lived on the bookshelf in my family’s living room. I got hours of joy out of reading the same, unchanging article about horses over and over again. 21st century kids don’t have that joy. Instead, they can read and edit their favorite horse-related Wikipedia entries, watch YouTube videos showing the gaits of those exotic breeds for which I only had static photos, and follow their favorite Olympic riders on Instagram. 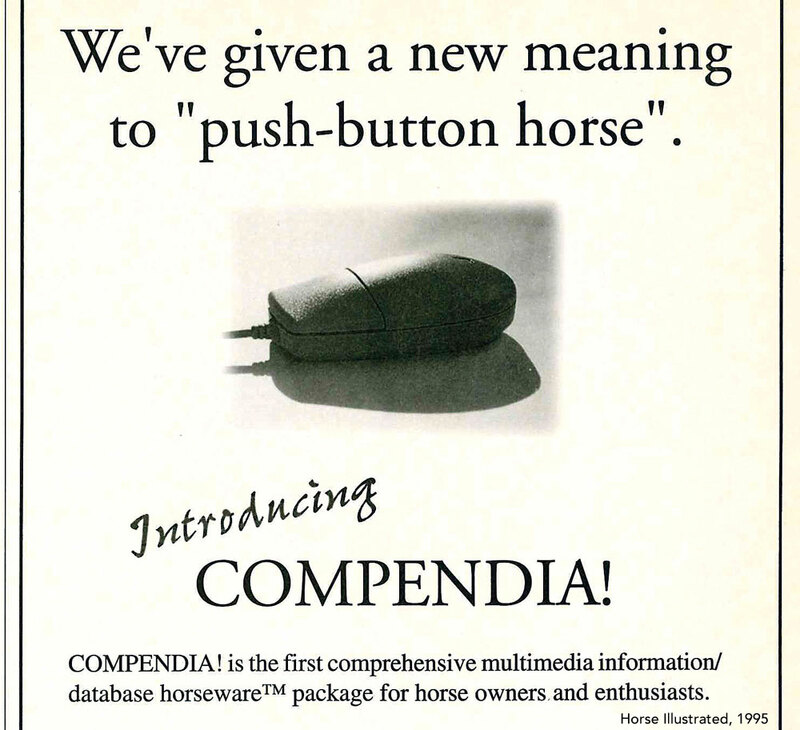 In between my deprived days and the current era of information overload, there were CD ROMs, like the COMPENDIA! Not only did COMPENDIA! provide a much more comprehensive resource on horse topics than my encyclopedias ever could, it included interactive features for keeping records, tracking bloodlines, and more. In fact, this ad from 1995 almost makes me yearn for the days when “the cloud” was a weather feature and computers actually had CD ROM drives. Those were the days.